At the end of December, our car – now officially named “Orange Crate” to go along with the other “named” Quantum cars such as “Black Beauty” and “Old Blue” – had been disassembled down to the bare frame. As noted last month, the old Kent engine was sold almost immediately, so the Quantum guys were able get started right away on the gearbox/driver train, suspension and hydraulics. Everything was taken apart, inspected and re-assembled or replaced as needed. 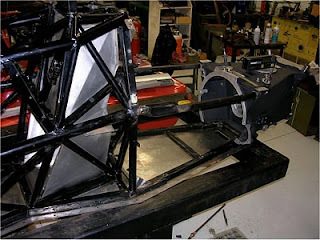 For the actual suspension components, this was a fairly simple process as all the important parts – wishbones, axles, stub axles, brake hats, etc., checked out okay. One of the tripod joints was junk, but that was about it. But for the hydraulics, it was time for a complete rebuild, including all three master cylinders and all four brake calipers. The worn steering rack bushings also were replaced, a standard Van Diemen maintenance item. The transmission was completely disassembled and turned out to be in pretty good shape, needing just regular maintenance; same with the differential, CWP and all the various bearings, carriers and related parts. The bell housing/oil tank assembly needed a bit more work, but turned out fine in the end with a fresh coating of matte black. All we need now is the Honda Fit input shaft, and the transmission can go back on the car. Likewise, the fuel cell was in good condition and now only needs the pump and other fuel-system components in the Honda Fit “chassis kit” – and then it can be re-installed on the car. Paperwork we got with the “Orange Crate” indicated the Penske dampers had fresh rebuilds from Stimola (good! ), but two warped brake rotors were discovered (bad! ), and replaced with fresh units from TDI Engineering. A couple of the uprights previously had their brake caliper mounting ears ground down excessively, most likely in a vain attempt to make up for the warped rotors (dumb and bad! ), so they were repaired properly. THAT wasn’t cheap, but necessary, and everything was bead-blasted, nickel plated, painted and/or powder coated as required. 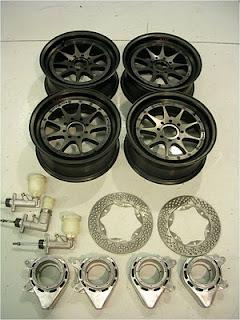 The biggest single expense for the month was the purchase of a set of RTS modular wheels, so that we can start the season with two complete wheel sets [and I’m sure I’ll be buying a third set at some point this year]. Pretty picture of new and cleaned up bits attached for your viewing pleasure…. While the new wheels might have been the largest single parts cost of the month, by far the most labor-intense job was straightening and aligning the engine bay. This is a critical area for Van Diemens, as the engine is a semi-stressed component, and one that is often overlooked or misunderstood by typical FF owner/driver/mechanics. But this isn’t the first Van Diemen rodeo for the Quantum boys, and the Millers understand the importance of proper engine alignment and the procedure to use to achieve it. Not a terribly difficult procedure, but one that demands the proper tools, knowledge, time – and patience. You begin by placing the bare frame on the shop’s surface plate – an elevated work table, completely flat and level in all dimensions. The frame was fine from the engine bulkhead forward, but the right side of the engine bay itself was twisted past repairable tolerances, most likely by a previous crash. That meant purchasing replacement right side tubing and hours of work [I haven’t had the courage yet to ask just how many hours] spent with digital levels, calipers, tape measure, straightedge, and shims of various thicknesses, to make everything square & happy once more. This is one of those time-consuming projects that makes you extremely proud once it’s completed, but miserable and cursing repeatedly while underway….. 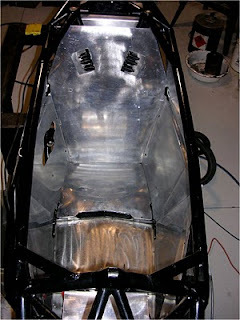 The final job for January was to prepare the chassis for pouring the foam/bead driver’s seat. At Quantum, they line the cockpit area with aluminum panels to create a smooth surface on the floor and sides. This makes it much easier to install and/or change out seats since they’re now made to expand and fit against a flat, smooth surface – rather than expanding out and forming around the chassis tubes. It also makes the cockpit area a bit safer for the driver in the event of a shunt – with fewer exposed tubes to hit with flaying arms, hands, etc. We still need to make the seat, which we’ll likely do on my next trip down to the shop. The Fit engine and engine kit should be arriving soon, and hopefully the Van Diemen chassis kit will quickly follow, so that we can finish up the transmission and fuel cell installation, clutch slave cylinder, engine mounts, etc. We also have to decide what to do about the radiators, as the ones that came with my car are aftermarket “double-pass” models and have a different plumbing arrangement from the stock VD rads, and start bolting everything together. Then there’s the installation of the Fit engine, ECU, wiring loom, et al. In other words, we’ve made a great deal of progress this month, but there still is a lot to do prior to our competition debut. We’re also working hard at finding a second driver for my car, and a driver for Quantum’s other Van Diemen, which is a couple of steps behind mine in the conversion process. I’ve had discussions with a pair of potential karting graduates in recent weeks, as well as with a young Midget/Sprint Car driver interested in giving road racing a try. Interest in the program – and in FF racing in general – seems to be growing, and that’s one of the primary goals of this project. To say it’s been a busy January is a bit of an understatement. At one point there were no less than ten cars at the Quantum shop: the seven (including mine) that currently “live” there, and three more visiting customer cars (a Van Diemen F2000 car, a VD RF97 FF and a Swift DB-1 FF) all getting repairs, winter upgrades, or pre-season prep work done. Wendell called them “groupies that just want to hang with the good-looking ones like Crate and Beauty”. Works for me…. That’s a wrap for this month’s update. By next time we should have received our first Fit engine and be close to – or (hopefully!) have already have competed – our first test at Hallett Motor Racing Circuit, a GREAT club racing/test track just up the road from the Quantum shop. Talk to you then. Here’s the frame on surface table with the engine bay alignment nearly complete – note digital level and caliper atop the refurbished bell housine/oil tank assembly. Some shiny, new bits (wheels, brake rotors) and shiny, refurbished old bits (uprights, master cylinders). Can you tell the difference? The aluminum panels tidy up the cockpit area and will help with seat making and installation. LE MANS, FRANCE, Thursday,4 February, 2010: Reigning American Le Mans Series LMP1 champions Highcroft Racing will race in this year's 24 Hours of Le Mans after being announced this morning as one of the 55 teams selected to contest the French endurance classic. Highcroft Racing's David Brabham - the winner of last year's 24 Hours of Le Mans with Peugeot - was in attendance at the Automobile Club de l'Ouest (ACO) press conference this morning in France. The Danbury, CT-based team will take its 2010 American Le Mans Series entry, the Honda Performance Development factory-backed ARX-01c chassis to contest the LMP2 class at Le Mans on June 12-13. "Getting an entry for Le Mans is extremely satisfying," Dayton said. "It has been a goal of ours since the creation of Highcroft Racing - preceding our relationships with both HPD and Patrón, winning our first race or even the championship. "This is something we have wanted to do for a long time and we are delighted and thankful for the opportunity and very proud of the fact we are invited to France. "Our goal has always been to establish Highcroft as a leading international motorsports organization - to do that, being at Le Mans is essential. "Brabham has played an integral role in the development of the Highcroft squad since his debut as part of the Acura factory program in 2007. He will defend his ALMS crown in 2010 teamed with Frenchman, Simon Pagenaud who last season took three poles, five race victories and six fastest laps while fighting against Highcroft. Marino Franchitti fills the third driver role for the team in long-distance races after scoring three pole positions, three fastest race laps and 10 podiums from 10 LMP2 class races last season. "For the reigning American Le Mans Series champions to go to Le Mans with the reigning winner of the 24 Hours is a remarkable opportunity," Dayton said. "We have long-standing and highly successful relationship with David and frankly, I can't imagine going to Le Mans without him. "He has been an integral part of our program since the beginning of Highcroft Racing and his breadth and depth of knowledge at Le Mans will be so important for us. "He has experience and a winning pedigree both in prototypes and GT cars at Le Mans - you couldn't pick a better man to lead your team at the 24 Hours for the first time. 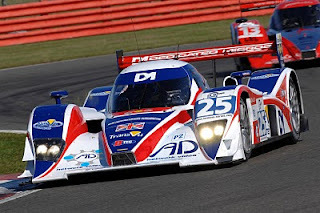 "Highcroft Racing is one of nine cars selected to contest the LMP2 class at Le Mans. The team will do battle against another HPD ARX-01c of Engalnd's Strakka Racing as well as two Pescarolo Judds, two Ginetta Zyteks, a WR Zytek, a Lola Judd and a HPD-powered Lola. "Even though we earned an LMP1 entry after winning in the ALMS last year, given the fact that a petrol-powered car really can't compete against the diesels at Le Mans, it really made sense for us take our current chassis and contest LMP2," Dayton said. "This will be our first flyaway race, our first time in Europe and our first time at Le Mans so we do have a lot to learn. "We're not under any false pretences regarding the size of the challenge ahead. Tackling an LMP1 victory at Le Mans was really not realistic for us this year, but we're very keen to challenge for the LMP2 win. "We are going to have to earn it, work very hard and be a quick study because most of the competitors we will be fighting with have been there before. "While our drivers have been to Le Mans and I've raced there four times, only a handful of our crew guys have done the race so we will be on a steep learning curve. "While the team competes in the American Le Mans Series as Patrón Highcroft Racing, advertising laws in France will not permit the team to display its regular colors. "We're going to be headed to France with new colors in June," Dayton said. "We would have loved to fly the Patrón flag in the biggest endurance race in the world, but we now have a great opportunity to introduce new marketing partners to a massive international audience." This is the first track test of the Formula F “Fit” production engine and HPD-produced ECU. It begins at 5:30 a.m., with the team heading up the “Grapevine”. Lots of fog, but at least it’s not raining. The track is fogged in as we arrive and get set up. “Cold” is the theme of the day, with a high of only 58 degrees. We have a short debrief with our driver, Robert Podlesni , to go over our goals and get him familiar with the dashboard configuration. Robert drives the track in our support vehicle to see what the grip level is like. It feels slick just walking around in the pit lane. Thank goodness he has many miles here. The fog lifts at about 10:00 a.m. and Robert heads out. Engine sounds good; but as he heads into Cotton Corner we hear silence! Oh … just a harmless spin in the damp conditions. Robert quickly gets back on track and gingerly does three more laps. “You get all the torque right away,” Robert informs us afterward. We nod knowingly, as we have observed this on the dyno and know it is a by-product of the restrictor. After an installation inspection, the track having dried, it is time for some long runs. Robert says the engine feels good and shifts good, but he is locking the left front before the right. After some discussion, we agree to just monitor the situation. The engine is running trouble free; all vital signs are good, and we get down to some 20-lap stints. 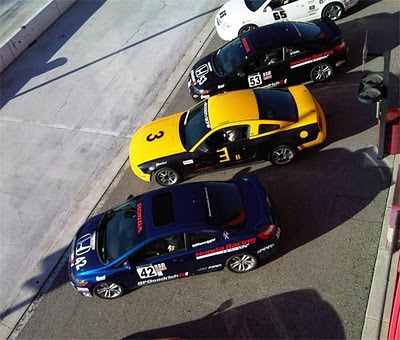 (A typical SCCA national is 18 laps long). Robert is turning consistent lap times, occasionally getting the car up on two wheels in the “bus stop” portion of the track. The HPD crew is pleased with how things are going. “We just keep putting gas in her and watch her run” says crew chief Billy Fetterman. Robert tells us the engine is a blast to drive; very responsive. As darkness falls, we end the day with 90 laps, 270 miles and some happy faces. Thanks to the HPD crew and thanks to Robert for a fantastic driving marathon. We can’t wait for the season to start. DAYTONA BEACH, Fla. (January 29, 2010) – Defending Grand-Am Continental Tire Sports Car Challenge series champion Compass360 Racing started its 2010 title defense in the strongest possible manner Friday, taking the Street Tuner (ST) class victory at the season-opening Fresh from Florida 200, part of the annual Rolex 24 weekend at Daytona International Speedway. Lawson Aschenbach and David Thilenius took their Honda Civic Si to the ST class win over a large, 36-car field in the first Continental Tire Sports Car Challenge (formerly KONI Challenge) race of the 2010 season, as the Toronto-based Compass360 organization began pursuit of its second consecutive ST championship. 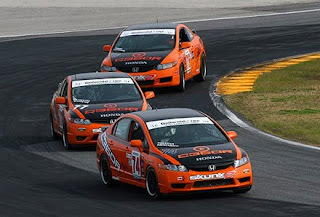 Additional Compass360 entries finished fourth (Ben and Don Theetge) and fifth (Ryan Eversley and Zach Lutz) as Civic Si’s claimed five of the top seven finishing positions. Following the Compass cars across the finish line at Daytona was the fifth-place Honda of America Racing Team (HART) Civic of Chad Gilsinger, Bryan Johnson and John Schmitt – all associates of Honda of America Manufacturing and Honda R&D Americas. 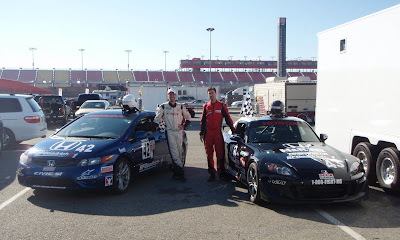 Jorge and Juan Leroux rounded out the top seven ST finishers in their LRT Civic Si. With the victory, Honda takes an early-season lead in the ST class manufacturers’ championship standings over rivals BMW, Mazda, Volkswagen and Porsche. The next round in the 10-race championship takes place March 6 at Homestead-Miami Speedway in Florida. The Continental Tire series also runs as part of the IZOD IndyCar Series weekend April 8-10 at Barber Motorsports Park in Alabama.